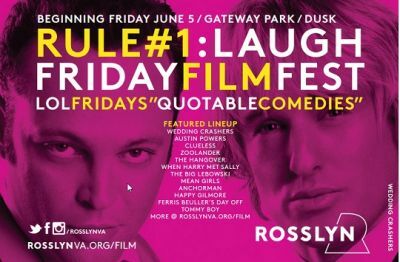 The theme of this summer's Rosslyn Outdoor Film Fest is LOL Fridays: Quotable Comedies. Beginning June 6, join us every Friday night in Gateway Park (1300 Lee Highway) for some free laughs. Bring a picnic to eat in the park, or grab dinner at a nearby Rosslyn restaurant. From Austin Powers to Tommy Boy, we guarantee these films will bring a smile to your face and help you relax after a busy week! Here's a preview of some memorable one-liners from this summer's films from our partner DC Inno. See you there!